Sawadika! I finally understand the song “One Night in Bangkok”. This place is crazy! Driving from the airport to our hotel was quite the ordeal with us negotiating with several different cabbies on better rates. We are staying at the Galleria 10 Hotel just off Sukhumvit Road; a main street full of shopping, nightlife and more. The hotel is very modern and we feel very comfortable with the location because it’s easy to get around. Our main purpose here is to check out the shopping that we’ve heard so much about. As we travelled through Thailand, many travellers and locals told us to save room in our luggage for better deals in Bangkok. We were not disappointed! Sunglasses for $2.00CAD each! Purses for $4.00CAD each! Shoes for $7.00CAD each! I have overloaded on material goods, much to the dismay of my hubby who “never wants to shop together again.” This city has a lot to offer fashionistas but it is time to see the cultural sights too. We’ve decided to visit the Grand Palace located just 25 minutes from our hotel. We arrived early in the morning to avoid the many tourists that flock here. One thing to be warned about is the scams that happen just outside the entrance. A popular heist is being told by a “Palace employee” that the Palace is closed today and that they can take you to some nearby cultural attractions. Unfortunately, these attractions are often shopping markets where the scammer is making a cut. The Grand Palace is splendid and very opulent. It is amazingly clean and well maintained considering it has been around since the late 1700s. The highlight was being able to enter the temple that holds the Emerald Buddha. It is surprisingly small but represents so much to Buddhist religion. One hour in the heat and the swarms of people was enough so we decided to head out. Night time can bring out the bad that Bangkok seems to mask behind the shopping and restaurants. Prostitution is no secret here and it can be painful to see the faces of many young girls that look like they have suffered a life time of misery. Bangkok is not my favorite place because of this. It seems you can pay for anything here. The streets are littered with young homeless mothers fanning their little ones. Everyone seems to be corrupt in Bangkok so I’m happy to go home. I’m glad I got to see it but there are much nicer places to spend time in Thailand. Back to Canada I go! 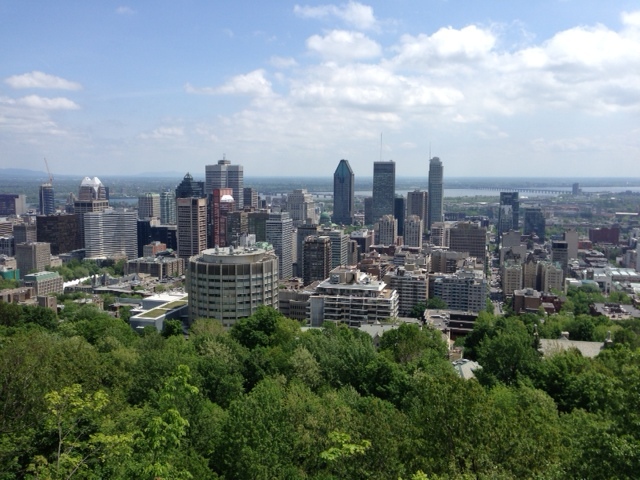 We decided that it was such a nice day out that we would climb to the top of Mont Royal. We took the bus to the park and started our assent. The first leg up is a winding road with a small incline. It cuts through the forest and you feel totally cut off from the city. It smells like you are right in the forest. There were quite a few people on the trail, joggers and walkers alike. After about 20 mins, you reach the stairs. 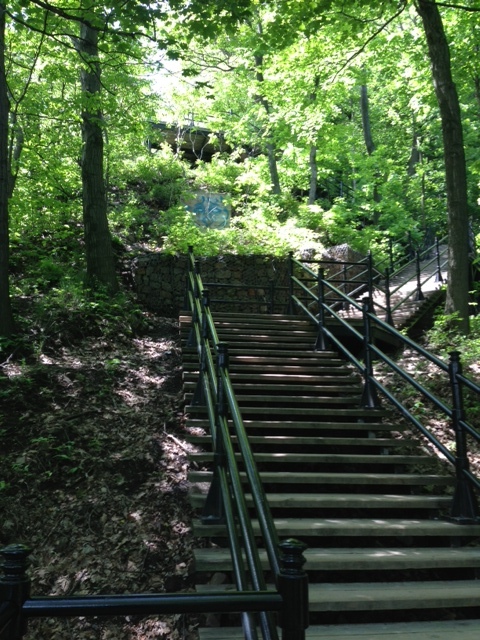 You can either reach the top by taking the 250 steps or continue on the path for another 2 km. Of course my Mom wants to do the stairs so up we go. It’s not as easy as you think but people are running by so to save face you have to continue. What someone failed to tell us was once you get to the top of the stairs there is still an uphill climb. So up we go again but it is worth it. The view of the city from here is beautiful and you can see downtown, McGill and the river. There is a chalet built at the top with a small store and washrooms. Someone mentions going up further to the cross but we pretend not to hear. It is a beautiful day so we sit and listen to the gentleman playing guitar and recover. The trip down is much easier and it is off to lunch. We wanted to try out smoked meat and last year we went to Schwartz’s so we went across the street to the Main deli where we heard the smoked meat is good. I have just the smoked meat sandwich which is $6.50 for a sandwich that is hard to wrap your mouth around. The rest have the special which includes the sandwich,fries, coleslaw and a pickle for $11.00. The food is great and we decide to walk home so we can have a quick look at Leonard Cohens house. Sitting at the airport after a wonderful trip to Montreal. If you can’t afford Europe this year think about Montreal. Don’t worry about a language barrier as most people speak English. Make sure you get on the Metro to explore all of Montreal and make a visit to the Plateau, my favourite place. Today is the main event. 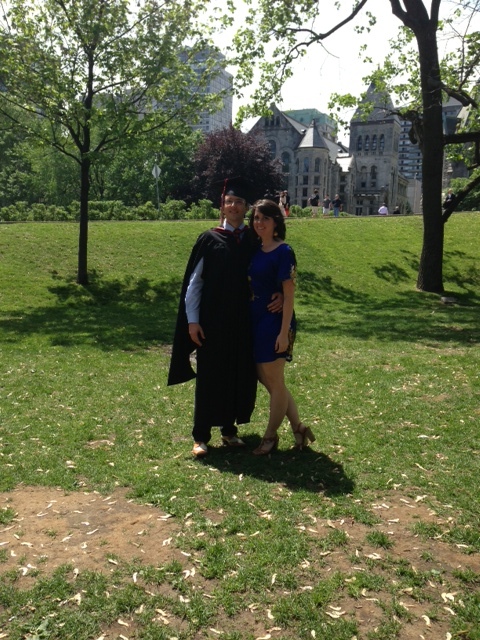 We have come to Montreal to see my nephew graduate from McGill. McGill is located downtown Montreal and sits on 80 acres of land. If you have time, it is really nice to stroll around campus. They have a store by the main gates if you want to purchase any McGill merchandise. The graduation is held in a big tent that sits 2500 people. They refer to the tent as a big airplane. After the grad we went back to our apartment as we have a large balcony. Then off to supper at the Restaurant Lombardi an Italian restaurant. I would highly recommend this restaurant. 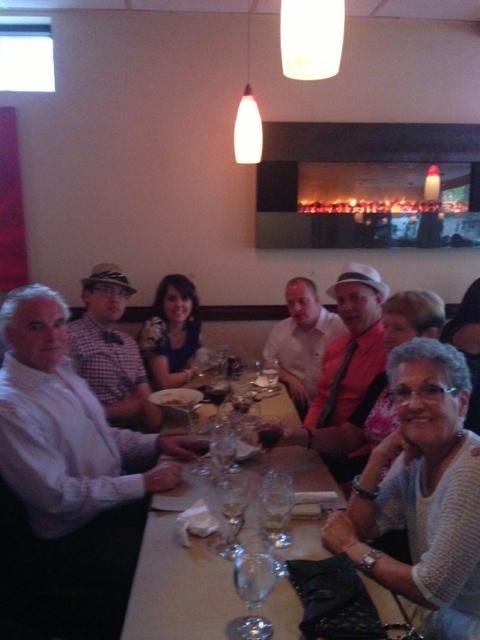 The food was excellent and great service. The best part is this restaurant allows you to bring in your own wine. They brought over an ice bucket to keep our wine cold and glasses all at no charge. You have to like that. Look for “Apporter Votre Vin” on the door. The restaurant is located at 411 Rue Duluth Est. The restaurant is in the Plateau and we were able to walk there. We arrived in Montreal to a little rain. 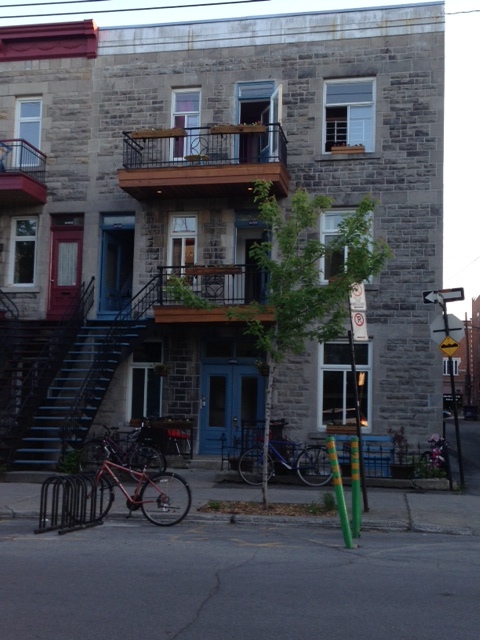 We rented an apartment in the Plateau which is my favourite part of the city. We are on Marquette street which is just off Mont Royal. Mont Royal reminds me of New York with a French accent. The street is probably 10 miles long filled with shops, restaurants and night clubs. The shopping is great. All the restaurants have windows at the front that open so its a great place to sit and people watch. The Plateau has over 30 terraces open during the summer. 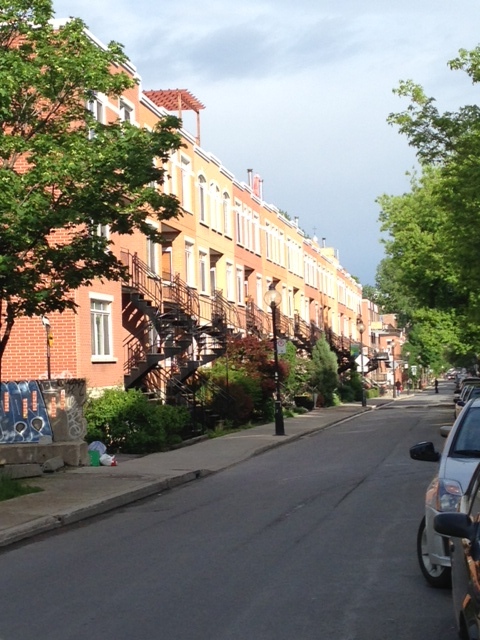 Just off of Mont Royal are the multi-coloured, multi level houses with their outdoor staircases and shady streets. Some of the nicest homes are here. The Plateau is home to young professionals and artists alike. In the middle of Mont Royal is the Metro station that will take you to all the other parts of Montreal. It is very clean and easy to use. The cost of a day pass is $9.00 and a weekly pass is $29.00. It is good on the Metro and the city buses. You can also rent bikes. The Plateau is a very good place to visit by bike. You can get a free bike across from the Metro station. The Plateau has many bike paths that keep you out of the traffic. By staying in the Plateau, it makes you feel like part of the neighbourhood and not just a tourist. It is still raining so we decided to go to Atwater Market. We take the Metro and we are there in just 10 minutes. Mont Royal is on the green line and it takes us right there. This is a bit smaller then the main market but it is full of fresh flowers, vegetables and a bakery where we sit for something to eat and a coffee. If you like outdoor markets, I would recommend this one. From there we take the Metro to Saint Josephs Oratory. It reminds me of the Sacred Heart church in Paris. 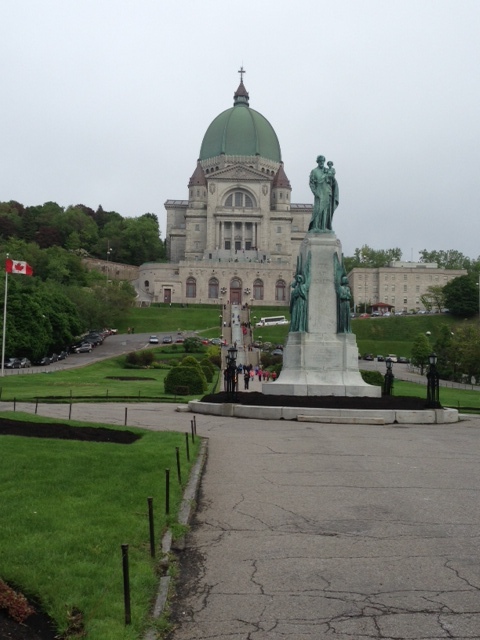 It sits on a high hill in Montreal and there are many steps to get to the church. If you can’t do the stairs, you can drive up. It is a beautiful church and we arrived to a concert on the organ. It was so nice just to sit in a beautiful church listing to the organ. This church is dedicated to Saint Joseph. The church was built by Father Andre and his tomb is there. He was canonised in 2010 by Pope Benedict and more than two million people still come to visit each year. This was worth the visit. We then took the bus to meet everyone for supper. We are up early to take the Metro to Old Montreal. This is a must visit for anyone coming to Montreal. There are many shops with cobblestone streets and artists to buy from. We went for lunch at Sport Cage. We went up to the roof where we could look over the port. It was a great view and nice to sit in the sun. After lunch we decided to take a boat tour so we could see Montreal from the water. We went with Le Bateau Mouche since they had a covered area to sit it since the wind had picked up. The cost was $24.00 which was worth every penny. They took us out and talked about the bridges, Mont Royal, Jean Drapeau island home of Expo 67 and 6 Flags park, and pointed out some of the highlights of Montreal. The tour was 1 hour. On the way back to the Metro we stopped at the Notre Dame Basilica. In the evening you can watch the sound and light show. Then back to our own neighbourhood to sit on one of the many patios for supper.